The Series L0 uses a magnetic levitation system to ‘float’ above the tracks, which allows the trains to attain those exceptionally high speeds. Shanghai currently has a commercial Maglev train route which runs at a top speed of 260mph, but it’s been known for sometime that faster speeds could be accomplished. 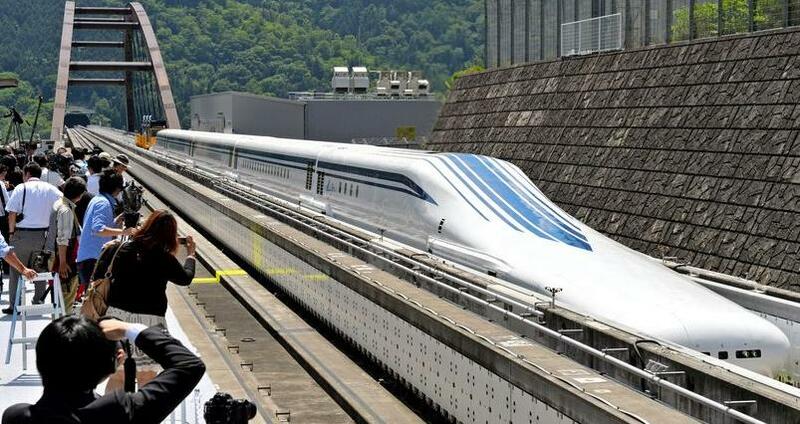 Japan has tested the trains at 361mph, while China is rumored to be at work on a 373mph Maglev train. When completed in 2027, JR Central’s Maglev train will transport passengers 160 miles from Tokyo and Nagoya in just 40 minutes, cutting the current travel time in half. In 2045 the line will be expanded to serve Osaka, bringing the project to a total cost of $102 billion. Pricey, for sure, but each high speed train will be able to carry 1,000 passengers, in comfort and relative quiet, along major routes. So is this possible in the U.S.? As Vox points out, “Amtrak released a proposal in 2010 that could allow trains to carry passengers from Washington to New York in as little 96 minutes, and from New York to Boston in just 84 minutes. But building the system would cost $117 billion and the project won’t be finished until 2040 at the earliest.” So we probably shouldn’t hold our breath. The first 100 passengers hopped aboard Japan's new blazing fast 'floating' Maglev train last week. The Series L0 train developed by Japan’s JR Central Railway Company is set to go into full service in 2027, but fans of super high-speed rail got their first taste of the 311mph train along a 27 mile route between the cities of Uenohara and Fuefuki.